Can Video Games Help Close the Digital Divide? 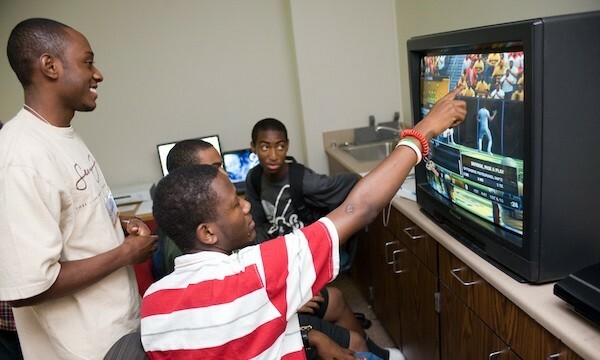 Applying African-American boys' passion for sports video games toward building confidence in a learning environment. This fascinating article by Liz Losh on Digital Media & Learning looks at how video games as learning motivator can be a completely different experience for different cultures. A recent report on educational achievement among young black males describes a “national catastrophe” in primary, secondary, and higher education that is reinforced by policy failures and funding shortfalls. “A Call for Change: The Social and Educational Factors Contributing to the Outcomes of Black Males in Urban Schools” uses data largely from the U.S. Department of Education to paint a grim picture of an achievement gap between black and white students, reinforcing the message of recent books like Pedro Noguera’s The Trouble with Black Boys: Race, Equity, and the Future of Public Education. While the Obama White House has become known for promoting video games as a way to teach science, technology, engineering, math, and as a method to promote healthier eating and exercise among kids with sedentary lifestyles and pop culture habits, often the Presidential message targeted to African-American urban youth emphasizes traditional print culture literacies in reading and writing. Researcher Betsy James DiSalvo from the Georgia Institute of Technology is taking a different approach to the achievement gap. Her work is focused on understanding the role that video games play in urban African-American youth culture. DiSalvo’s advisor, Professor Amy Bruckman, has been known for her research on gender and computer gaming that stretches back for more than a decade. (Bruckman also wrote seminal essays questioning cyber-utopianism that were written in the nineties, such as “Finding One’s Own in Cyberspace” and “Cyberspace is Not Disneyland"). By thinking about “games as a motivator” rather than as a means of what The Chronicle of Higher Education has recently called “stealth assessment," Bruckman argues that researchers can find out a lot more about learning and its relationship to cultural norms and that “looking at masculinity” might provide a fundamental “key to understanding."